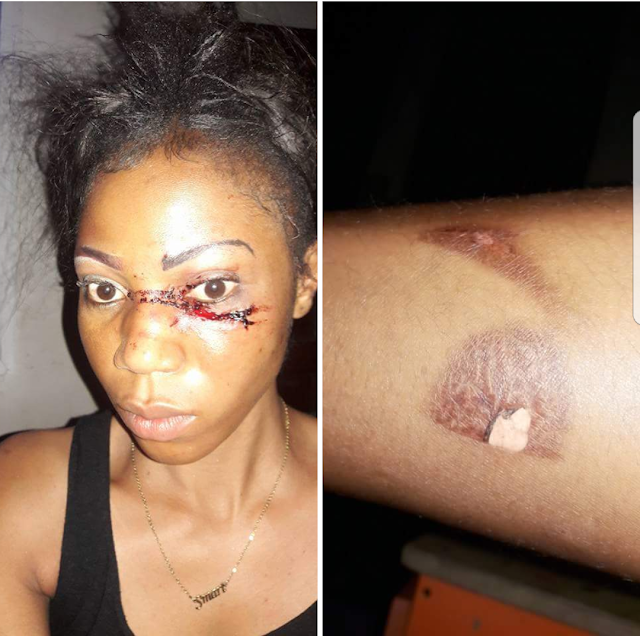 A Nigerian lady has narrated her close shave with death after she jumped into a fake Uber without checking to confirm if it was the ride she ordered. Annabel Fred who posted her story on Facebook had gone shopping at Shoprite with her friend and when it was time to leave, ordered a ride from Uber but didnt confirm it was the ride when the driver arrived. She suffered a cut to the face and lost her two phones to the dubious men who picked her up at the end of the day. Read her story and take a learning or two. Sorry to bother you friends!! But I had to use a friend's phone to share this!!! 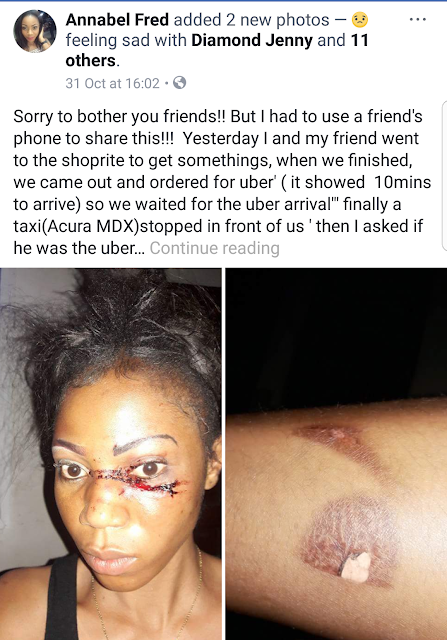 Yesterday I and my friend went to the shoprite to get somethings, when we finished, we came out and ordered for uber' ( it showed 10mins to arrive) so we waited for the uber arrival''' finally a taxi(Acura MDX)stopped in front of us ' then I asked if he was the uber we ordered? Yes I am ma' he said! Then we both entered and i asked him to start the trip: he then said ok and drive off, he drove for sometime then slowed down' when we asked y the slow down, this car is having issues ma; let me check :: he said( pls my money is reading o I told him) sorry ma we not on surg, he replied,I then said ok o,As he stopped, another guy quickly entered the car then the driver doomed off immediately-- sharply i even tried to open the door and run ; but all to no avail then i realised we were in big troubled ::: my friend started shouting and crying- then one of guys came to the back seat held her neck so hard that she couldn't even scream: then they asked me to give them my phones ( I left my phones at home I told them) the other guy used his gun to hit my eye( he brought out a small knife, pepperspray, and small axe). He asked for the second time ' where is your phone? I see 2 phones for your hand , where them dey?then I had no choice than to give him my phones when i saw blood dropping , he started beating us and asked his friend to give him that handkerchief ( but the guy driving said his spirit doesn't want him to harm us) but he should collect everything from us: so they collected the things we bought @ the shoprite, they took my friend's phones and mine too, her waist watch, my neckchain, our handbags, asked for our atm cards and tnk God none of us came out with it,they searched us and collected the cash we had on us' they even collected my friend's ear rings😅-- then dumped us on a lonely part: A good samarithan gave us 1500 to transport bk home we told him what happened-- I just had to share this so we can be very careful this period:::the mistake we made was : not calling the uber number to confirm if trully he was the person: I just want all of you thank God for me o. What if we were killed ? Just few weeks to my service and this happened? 2 months to the end of 2017? Wetin our mama for do? Please guys, let's be careful bill!!! thank you and God bless u.